Today we are lucky enough to have Nikisha with us Guest Blogging - she is such an amazing person that also has created a non-profit in order to help others. Please take a moment to read her post, visit her websites, and feel free to leave comments in response on our Facebook page. 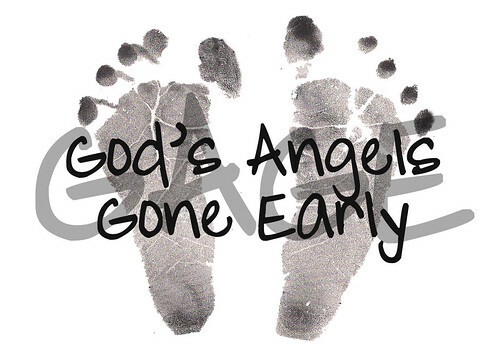 My name is Nikisha and I am a mommy to a sweet baby boy who is in the arms of God and this is the beginning of my stillbirth journey. A week and a half before my due date I am getting excited that I am about to bring my firstborn child into the world. The only thing on my mind is making sure everything is in place so that when he comes I will not have to worry about buying anything else. I just had a baby shower at work a week or two before so everything was really coming together. It is Monday morning and I am scheduled for a routine weekly prenatal checkup. Everything looked good even though it took the Doctor a couple of minutes to find the heartbeat I then mention that the baby did not move as often as he used to. The Doctor did not say anything about it he just kept looking for his heartbeat and he finally found it. Three days later I am woken up by a sharp pain and I thought I was going to start having contractions but nothing else happened and I went back to sleep. The next morning I went to my scheduled ultrasound with the father of my baby. I was excited because this would be the first time he would see the Ultrasound since he was out to sea for the latter part of my pregnancy. The Ultrasound technician started looking at the baby everything looked good and then she made it to his heart and she looked at it for a minute and then said she would be right back. My heart started sinking because I knew something was wrong since she left in the middle of the ultrasound. After a few minutes my Dr. and his nurse came in and the Dr. took a look at the ultrasound and then he told us the bad news that my baby died. Sitting there in shock not knowing what to think, feel, say, or do the Dr. tells me to go into an exam room. Still in shock we go into the exam room and the tears start to fall and the nurse consoles me. The Dr. examines me to see if I had dilated any and I was almost two centimeters dilated. He then proceeds to tell me the procedure of things to come. We then schedule an induction to start at midnight. I am silently praying and bargaining with God to perform a miracle. I check in the hospital at midnight and at 9:45pm I give birth to Raekwon Kemel M. As they are cleaning him off I am praying silently for God to give my baby life. I was able to hold him the entire three days I was in the hospital as often as I wanted to. I could not hold him too long because he was cold and they did not want his body to warm up too much. An experience I will never forget. The years after Raekwon’s death I suffered with a deep dark depression and turned away from God because I did not understand why He was allowing this to happen to me. After about five years of being sad I was flipping through the channels and came across this preacher and what he was saying applied to my life and that was the new beginning to my renewed faith. This is just a brief detail of my story. More will come as I write down my ongoing experiences. It has been almost twelve years and there are still times I get sad about not having my son here. Hopefully by sharing my story will let you know that you are not alone and you can overcome this tragic circumstance especially when God is involved. I started a nonprofit organization where we donate care bags to parents experiencing stillbirth and neonatal loss. I ship the bags everywhere and donate them to churches and hospitals. I also started a blog because the journey after having a stillbirth cannot be told in one sitting. You can check it out at http://precioustendermoments.blog.com. You can also find my website at http://precioustendermoments.org.